Product information "Shimano Rapidfireshifter XTR SL-M9000 I-Spec right 1x11 speed"
Mountain biking has rapidly evolved since the previous introduction of Shimano's top level XTR groupset. Shimano sees different directions in mountain biking with wheel sizes and riding styles changing and now defines four main categories within mountain biking. Competitive Cross Country is driven by physical efforts while Enduro focuses on more technical challenges but both have equivalents at the non-competitive Trail level. To serve mountain bikers who will only settle for the best, Shimano today introduces the new rider tuned XTR M9000 groupset. I-Spec II is a new integrated mounting system for brake and shifting levers. It just needs one bracket which saves space, provides a cleaner optic and saves about 10g of weight. Furthermore the adjustability in horizontal direction offers an optimized individual setup. Instant Release allows for quicker shifts, as it instantly releases the cable when the trigger is activated. Multi-Release allows shifting two gears at once in both directions. The levers are also equipped with 2-Way Release for different riding styles or shifting (indexfinger or thumb) from various riding positions. The upper lever still performs the same function, but it swings both ways. Pull it with your finger or push it with your thumb - you choose. 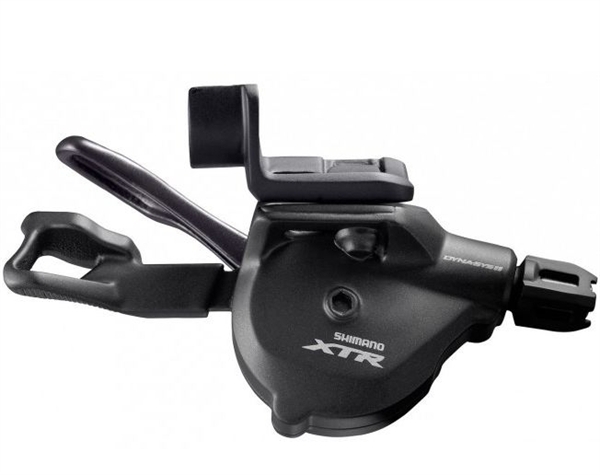 Related links to "Shimano Rapidfireshifter XTR SL-M9000 I-Spec right 1x11 speed"
Customer evaluation for "Shimano Rapidfireshifter XTR SL-M9000 I-Spec right 1x11 speed"